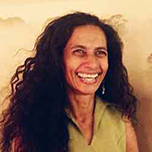 Niyanta Spelman is the founder and executive director of Rainforest Partnership. Between 2000 and 2007, she owned PPPMC Inc, a public sector-oriented management consultancy. She currently serves on the board of the Asian Pacific Islander American Health Forum, based in San Francisco, is an advisor to SxSW Eco and is an adjunct faculty member at the LBJ School of Public Affairs at University of Texas at Austin. She was a founding member of Texas Federation of Asian American Chambers of Commerce, served for several years on the Austin Zoning & Platting and Planning Commissions and on the boards of various nonprofit organizations.